Open sign-up for user accounts is now closed. Expect a short approval period before your account is active, as each user account must be activated manually. We are hosting a external forum as an experiment for iGEM 2009. This will be a place for participants to ask questions and get information. It is not a moderated forum nor is it hooked up to the iGEM/Registry single log-in system. If you would like to post on the forum you must create your own user ID and password. Open sign-up for user accounts will be held from Wednesday, July 29 to Wednesday, August 5. After that time user accounts will not be automatically approved so you should expect a short approval period before your account is active. The reason for this policy is to reduce spam on the forum. 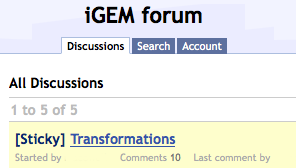 The forum is not moderated but iGEM HQ will have a presence on it to help answer specific questions.